We finished up our forest unit by learning about reindeer. 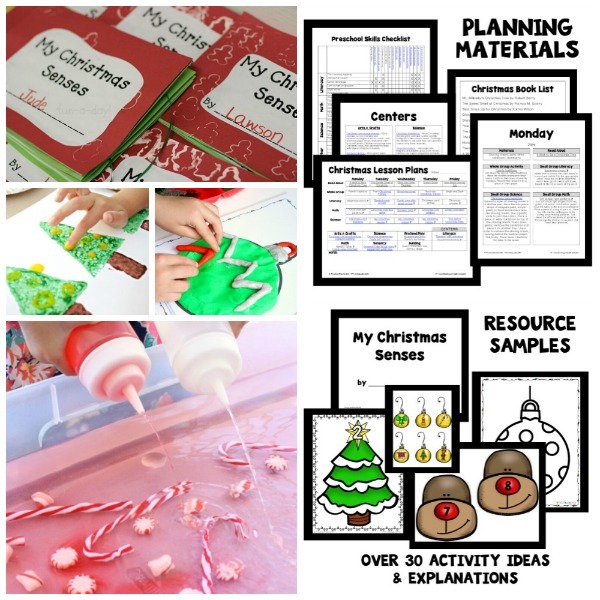 We included a variety of fiction and nonfiction books and related activities with a little bit of Christmas fun sprinkled throughout. 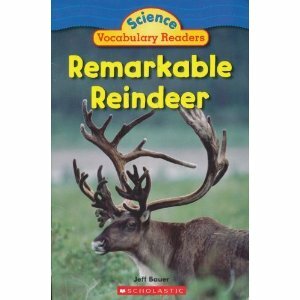 I also have this Remarkable Reindeer Science Vocabulary Reader from Scholastic. We read a few facts about reindeer each day. On the first day we read about where reindeer live. The kids enjoyed using our globe to find out where we could visit reindeer, so I also pulled up the Running Reindeer website. It is a website for a reindeer ranch in Alaska. The kids were amazed to find out that people could really go and visit reindeer, and we enjoyed reading the brief bios about some of the reindeer there. We also learned that wild reindeer are called caribou in North America. 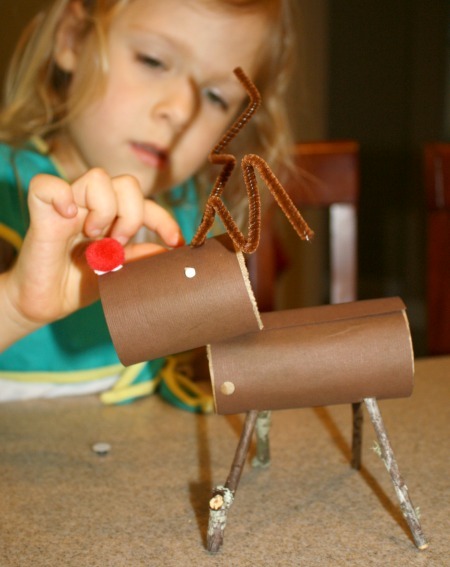 This fact came up again later in the week while we watched The Polar Express and made our own reindeer craft. Another day we read that reindeer antlers can be three feet tall. 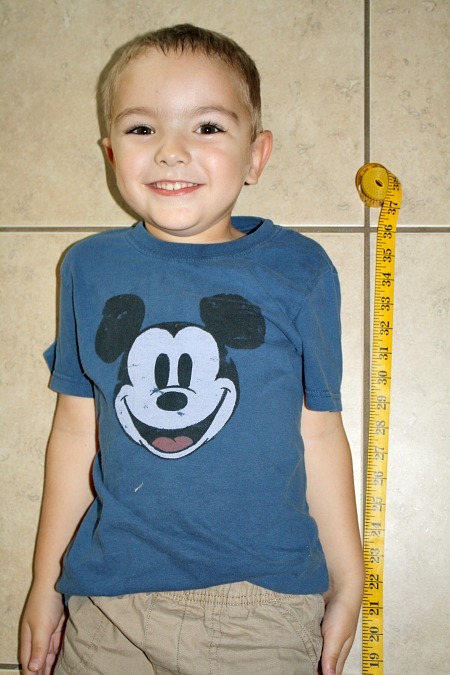 We measured each of the kids to compare their height to a reindeer’s antlers. The kids were just a few inches taller! And they thought it was really funny when I said we could let one of them stand on the other’s head to see how it would feel to have something three feet tall growing out of your head…no, we didn’t try that one! 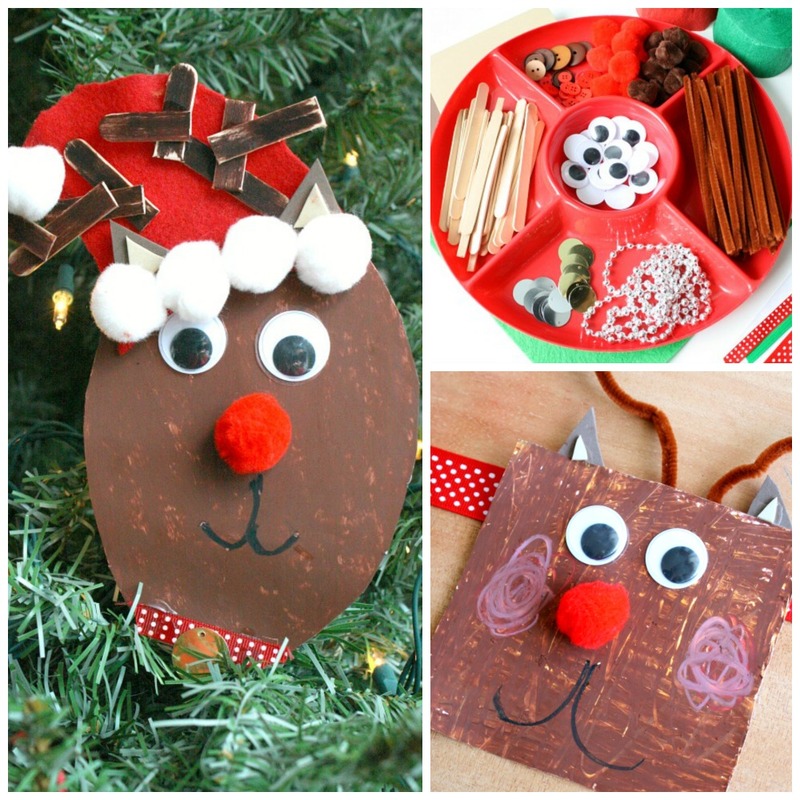 We also learned about the kinds of food reindeer eat, so I decided to combine that fact with our reindeer craft. 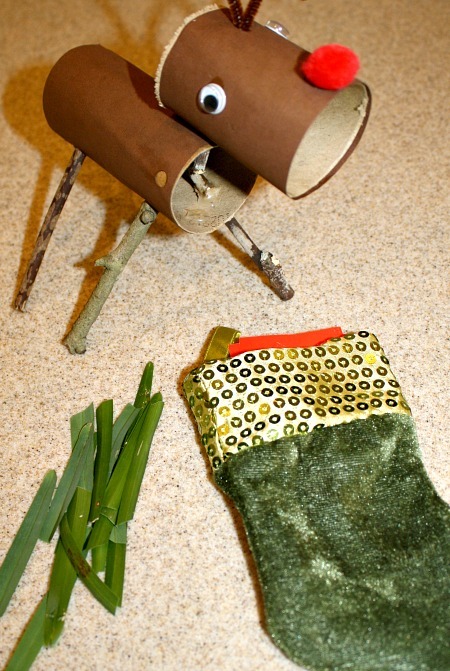 I modified this posable reindeer craft by including twigs for legs. 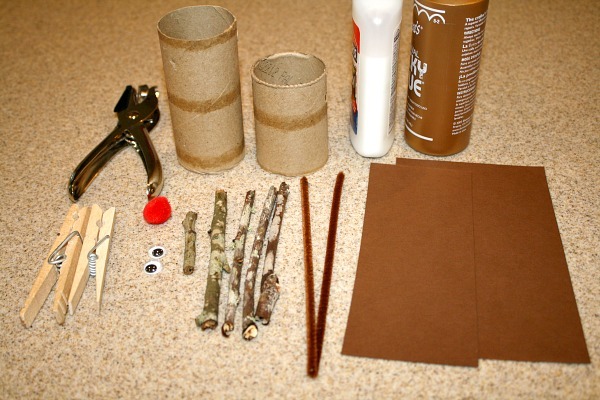 We glued brown paper to paper towel tubes that we cut to size. Then I poked holes for the legs and antlers. We attached and reinforced everything with tacky glue. I knew they would probably be playing rough with these, so I tried to reinforce them well. 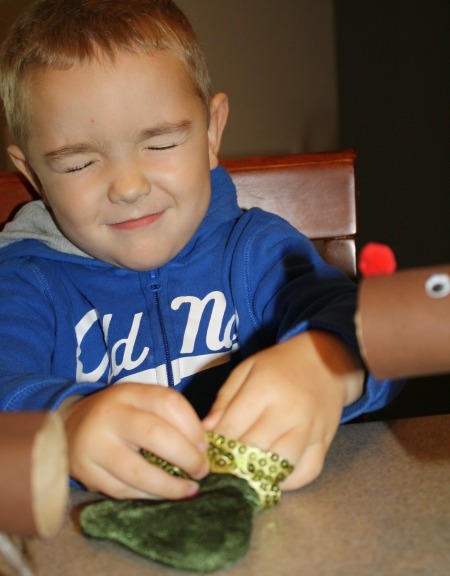 Although if I did this craft again, I would have used the quick dry tacky glue. The kids were very eager to play, and we had to wait over night for all of the glue to set. 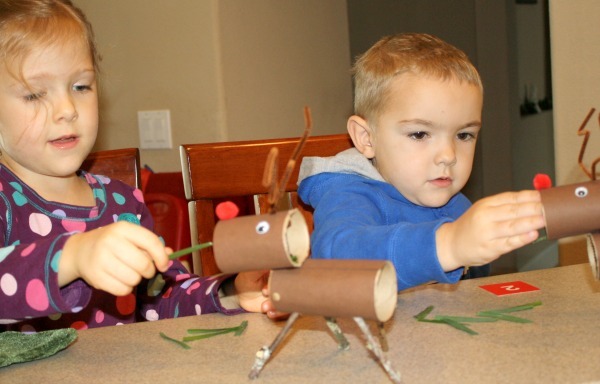 When the glue dried, the kids had a lot of fun playing with their reindeer, I mean caribou. I could only chuckle as Lovey kindly corrected me after I called hers a reindeer. She said, “Mommy this one is a caribou. We live in North America.” At least she is learning a few facts along the way. After they had plenty of time for free play I put together a game. We reviewed what kind of foods reindeer like to eat, and we decided that we would feed our reindeer grass. Each child gathered ten pieces of grass from outside. I added number cards 1-10 to a small stocking. Then the kids would close their eyes as they chose a number card from the stocking. I just love how serious they are about closing their eyes SO tight. It makes me laugh every time. 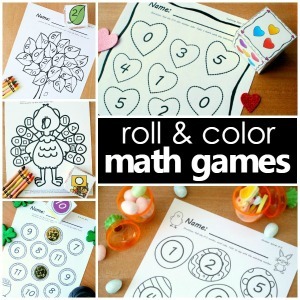 For this activity we focused on number recognition, but you could also use a number cube or cards with dots on them. A more advanced option would be to add one to the number pulled. If the number pulled was three, the child would add one and then feed the reindeer four pieces of grass. After identifying the number, they would feed their reindeer that many pieces of grass. They played long after I introduced the activity, and each of them came back to play a few different times as the week went on. 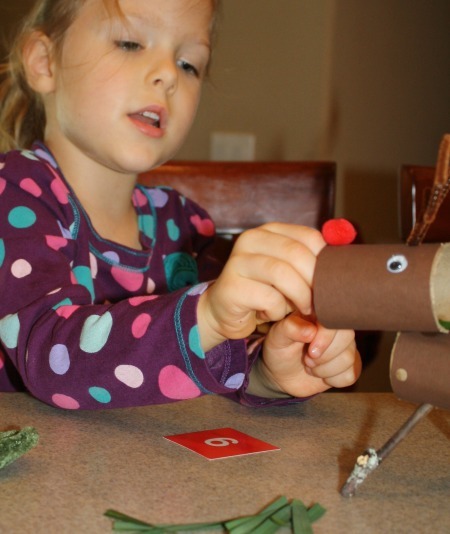 Each time they fed their reindeer, they would say, “But he’s STILL hungry.” That is a line from The Very Hungry Reindeer free printable booklet that we also made during our reindeer activities. 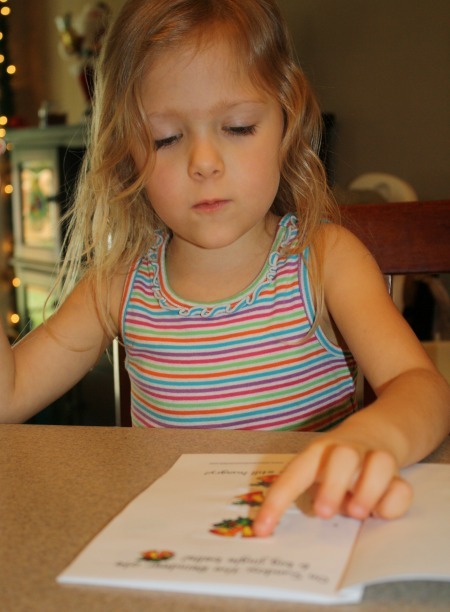 It is a cute little book that is great for counting and retelling practice. Both of the big kids enjoyed rereading it throughout the week. 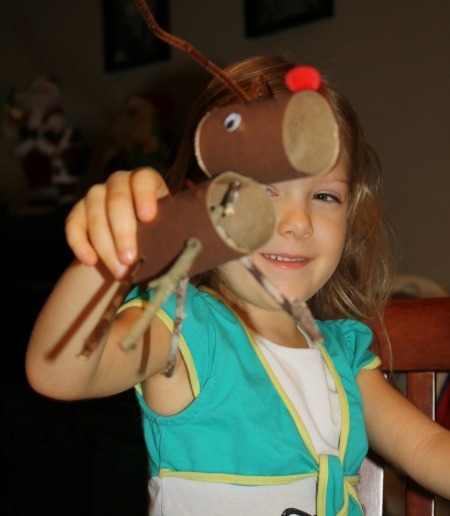 What activities have you done to help your kids learn about reindeer? 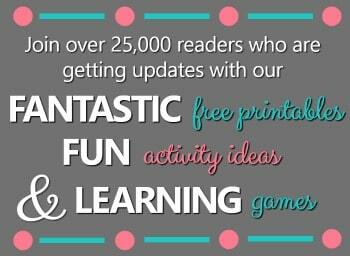 For more great activities to go along with Jan Brett’s books. 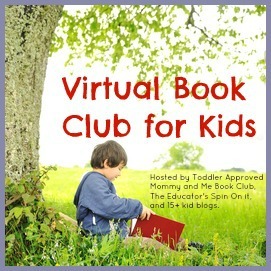 Check out The Virtual Book Club for Kids. I love these activities. In my village we hunt reindeer for substance. We have reindeer roundup in July. They are amazing animals, regal and beautiful. 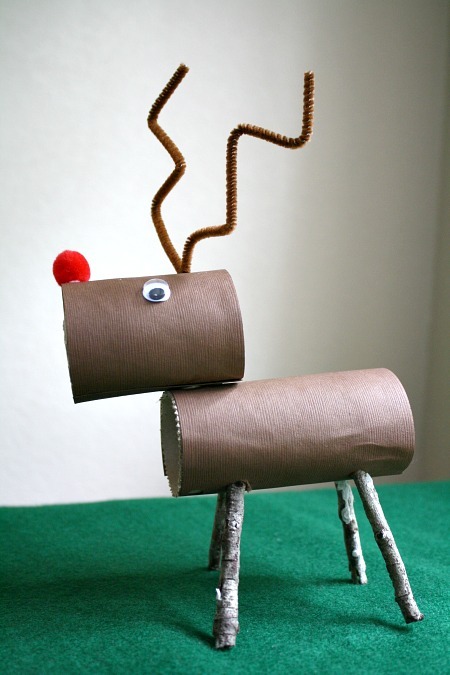 I will be using your activities next school year to teach my students about reindeer. Side note, one of my students told me that Santa doesn’t visit their house because they ate his reindeer. Gotta love life in bush Alaska. Thank you for sharing, Nona. Where we live kids view reindeer more as mythical creatures since we only hear of them and see them in pictures, so it is interesting to hear how they play a role in your community and how kids view them a bit differently. I hope your students enjoy these activities next year! What a great idea to add the science book in with the others. I love pairing a fiction and non-fiction book together. Thanks, Ticia! I always like to pair fiction and nonfiction, too. Very cute! I always like the margins of Jan Brett’s illustrations. Thanks for linking up to The Chidren’s Bookshelf! Thanks! We enjoy Jan Brett’s illustrations, too…so much to explore and discuss.